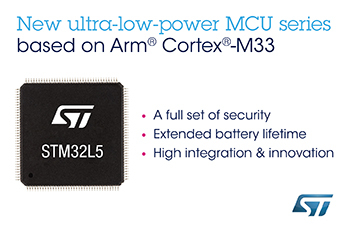 STMicroelectronics (NYSE: STM) , a global semiconductor leader serving customers across the spectrum of electronics applications, is bringing sophisticated cyber-protection to power-conscious connected devices with the new STM32L5 microcontroller (MCU) series featuring the Arm® Cortex® -M33 core. Building on the Cortex-M33, which boosts protection for small devices by integrating Arm’s TrustZone® hardware-based security, ST’s STM32L5-series MCUs add further enhancements including flexible software isolation, secure boot, key storage, and hardware cryptographic accelerators. They also provide rich functionality, high performance, and long run-times powered by coin cells or energy harvesting. Consuming as little as 33nA in shutdown mode and achieving 402 ULPMark-CP in the EEMBC ULPBench, the new MCU series builds on the Company’s expertise in low-power techniques such as adaptive voltage scaling, real-time acceleration, power gating, and multiple reduced-power operating modes proven in previous STM32L series. With extensive integrated digital and analog peripherals, and consumer and industrial interfaces such as CAN FD, USB Type-C™, and USB Power Delivery, STM32L5 MCUs provide an ideal platform for products such as industrial sensors or controls, home-automation devices, smart meters, fitness trackers, smart watches, medical pumps or meters, and many others. STM32L5-series microcontrollers are sampling now and scheduled to begin production in Q2 2019. ST will unveil the STM32L5 series MCUs in a demonstration, created in collaboration with security-software specialist Prove & Run at Arm TechCon, October 16-18, in San Jose, California. The TrustZone IP integrated in STM32L5 series MCUs implements trusted-computing principles for authenticating devices connected to a network. First conceived for equipment such as desktops, mobiles, and communication infrastructure, this hardware-based approach blocks attempts to corrupt devices or software and creates a protected execution environment for sensitive code and cyber-protection such as cryptography and key storage. The new STM32L5 series MCUs, featuring the Cortex-M33 core with TrustZone, now make this high-end protection accessible for the resource-constrained embedded systems that drive the smallest IoT devices. STM32L5 series users get extra freedom to include or exclude each I/O, peripheral, or area of Flash or SRAM from TrustZone protection, allowing sensitive workloads to be fully isolated for maximum security. In addition, ST has engineered TrustZone to ensure support for secure boot, special read-out and write protection for integrated SRAM and Flash, and cryptographic acceleration including AES 128/256-bit key hardware acceleration, private key acceleration (PKA), and AES-128 On-The-Fly Decryption (OTFDEC) to protect external code or data. Active tamper detection and support for secure firmware install are also included. In addition to the flexible power-saving operating modes and ST’s ultra-low-power technologies, the STM32L5 series also features a highly efficient switched-mode step-down regulator that improves low-power performance when the VDD voltage is high enough and can be powered up or down on-the-fly. Leveraging high core performance, including support for DSP instructions and floating-point arithmetic, STM32L5 series MCUs achieve up to 165 DMIPS/427 CoreMark™ using the ST ART Accelerator™ at 110 MHz. As a novel enhancement in STM32L5 MCUs, the proven ST ART Accelerator now supports both internal Flash and external memory with an 8KByte instruction cache for greater efficiency in case the software runs out of external memory. 512 Kbyte dual-bank Flash allows read-while-write operation to aid device management and ensures a high level of safety by supporting Error Correction Code (ECC) with diagnostics. There is also a 256Kbyte-SRAM and features to support high-speed external memory including single, dual, quad, or octal SPI and Hyperbus Flash or SRAM, and an interface for SRAM, PSRAM, NOR, NAND or FRAM. The STM32L5 series also introduces new digital peripherals including USB Full Speed with dedicated supply allowing customers to keep USB communication even when the system is powered at 1.8V, and a UCPD controller compliant with USB Type-C Rev. 1.2 and USB Power Delivery Rev. 3.0 specifications. Smart analog features include a state-of-the-art analog-to-digital converter (ADC), two power-gated digital-to-analog converters (DAC), two ultra-low-power comparators, and two operational amplifiers with external or internal follower routing and programmable-gain amplifier (PGA) capability. The STM32L5 series is available in standard temperature grade for consumer and commercial applications, or high-temperature grade specified from -40°C to 125°C for challenging environments. In 2017, the Company’s net revenues were $8.35 billion, serving more than 100,000 customers worldwide. Further information can be found at http://www.st.com. CAN FD: CAN with flexible data rate, offering greater flexibility to optimize bandwidth and data payload. CoreMark: industry-accepted EEMBC framework for comparing microcontroller/CPU performance.